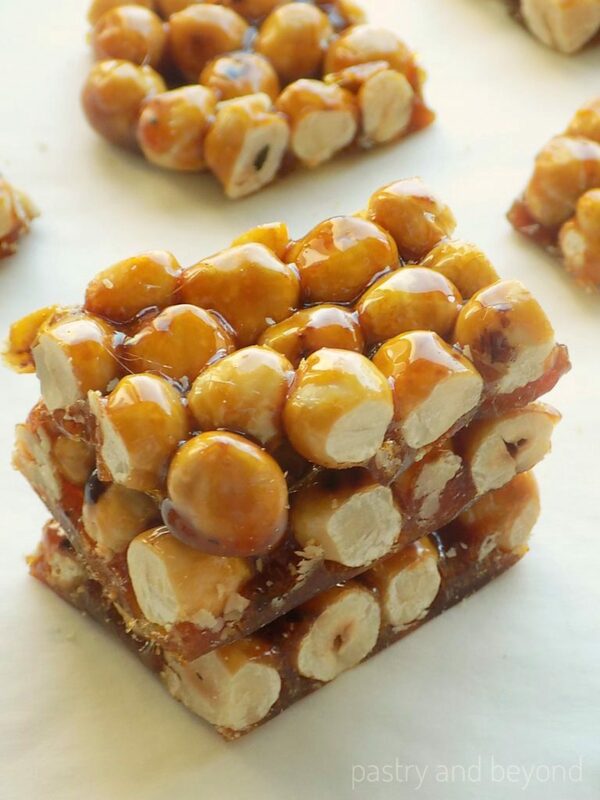 You only need 2 ingredients to make these crunchy candied hazelnuts! 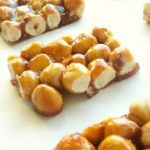 This yummy hazelnut praline recipe is so easy to make! 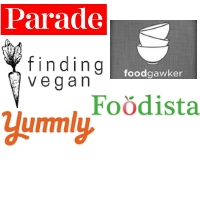 I am going to share a recipe with caramelized hazelnuts. First I thought of giving a link to my caramelized almonds recipe as I use the same method: I caramelize the sugar first and mix with roasted hazelnuts. But I thought these beautiful caramelized hazelnuts deserve a special post. These candied hazelnuts are very easy to make and tasty. I especially use chopped caramelized hazelnuts with ganache in my cakes. I love eating this delicious candy plain too. First I toast the hazelnuts. I place them in a pan and toast over medium heat. I stir almost in every 15 seconds to prevent them from burning. Then I caramelize the sugar. I place the sugar in a big pan over medium heat. I don’t stir but swirl the pan. If I stir, the sugar will crystallize and I have to keep stirring. So I only swirl the pan and the sugar melts evenly. (If you see sugar crystals that form on the edges of the pan, you can brush them down with a pastry brush that is dipped in cold water to avoid crystallization). Then I add in the hazelnuts and take the pan from the heat. I make sure that all the hazelnuts are coated with sugar. I place the caramelized hazelnuts on the parchment paper and flatten with my spatula. Finally, I cut into small pieces. That’s all! 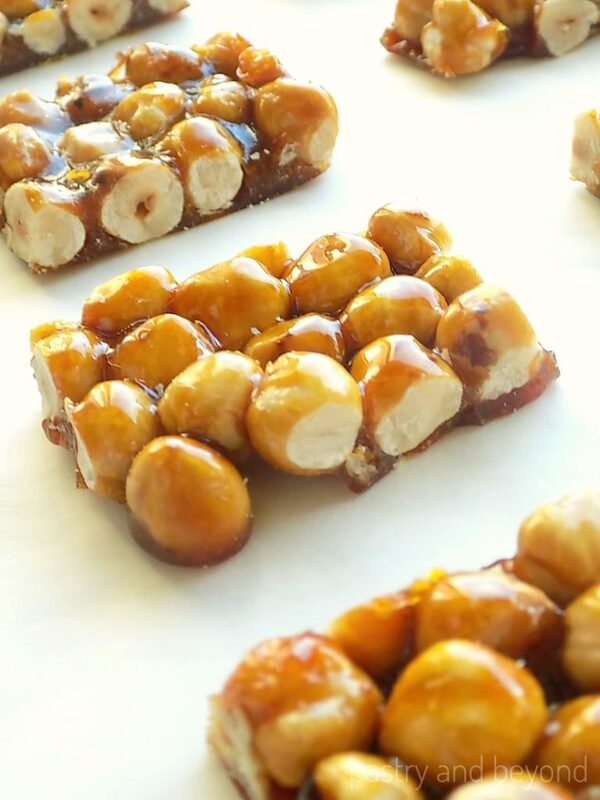 Enjoy these yummy candied hazelnuts! 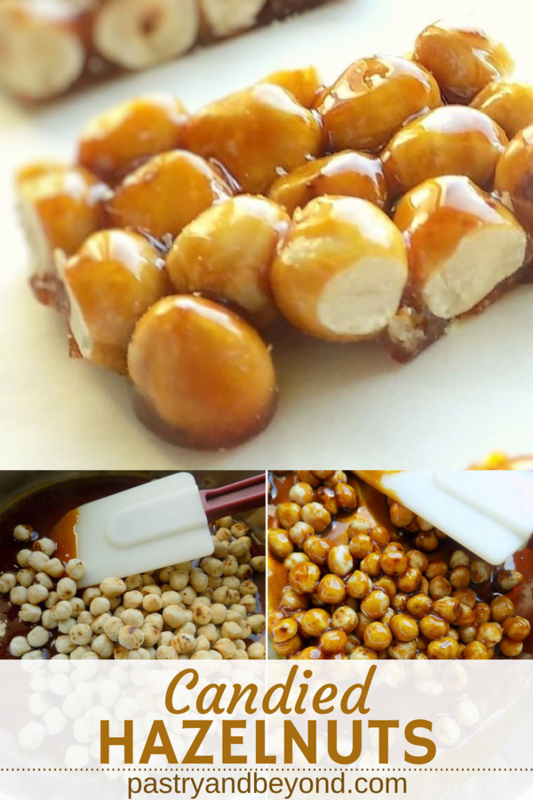 Crunchy candied hazelnuts are so easy to make with only 2 ingredients! They make a nice combination with ganache in my cakes. They are perfect to eat plain too! 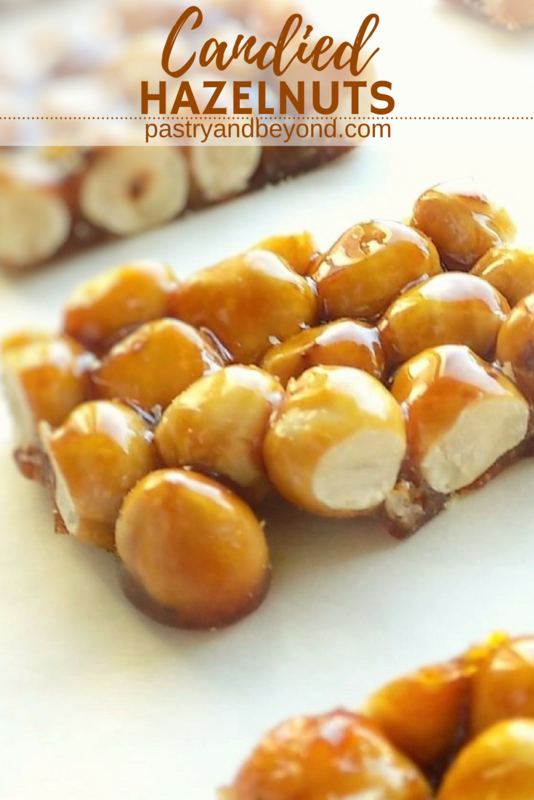 You'll love this hazelnut praline recipe! Toast the hazelnuts in a medium pan at low heat. 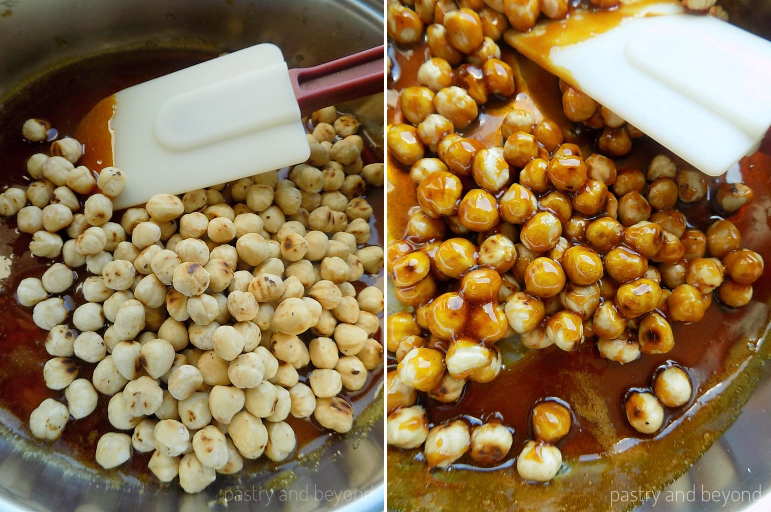 If you use roasted hazelnuts it will take almost 3-5 minutes. Stir in every 15-20 seconds to prevent them burning. When they give off their aroma, remove the pan from the heat and set aside. (If you use raw hazelnuts, toasting step will be a little bit longer.) 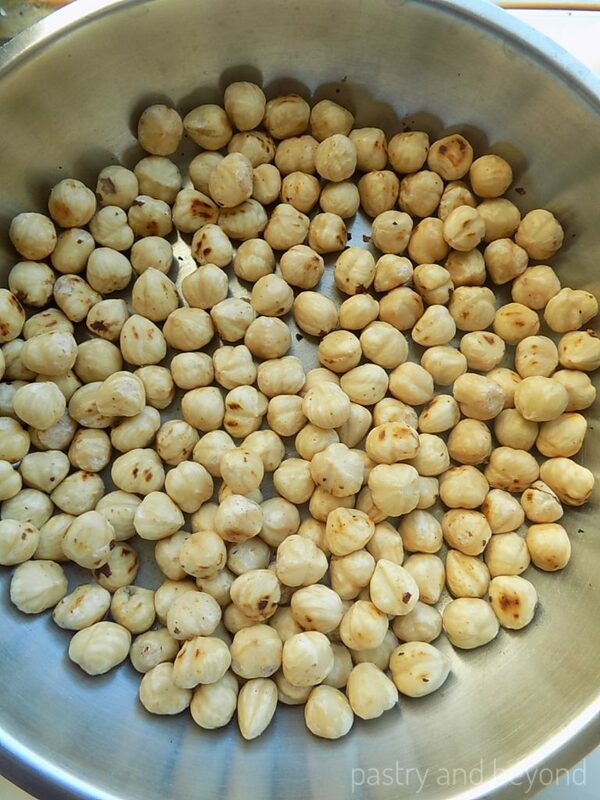 Alternatively, you can toast the hazelnuts in the oven by placing them on a baking sheet at 350°F(177°C) until they are golden brown and give off their fragrance. Place the sugar in a big pan over medium heat. Don’t stir but swirl the pan to avoid crystallization. Swirl the pan and the sugar melts evenly. If you see sugar crystals that form on the edges of the pan, you can brush them down with a pastry brush that is dipped in cold water to avoid crystallization. When the sugar mostly melts-it takes 8 minutes, put melted sugar on top of unmelted sugar with a long heat proof spatula. This step helps melted sugar not to burn but unmelted sugar to melt. If you see unmelted parts you can stir with your spatula, they will melt immediately. As the sugar melts and turns to amber color, remove the pan from the heat immediately and carefully add in the hazelnuts and stir until all the hazelnuts are covered with sugar. 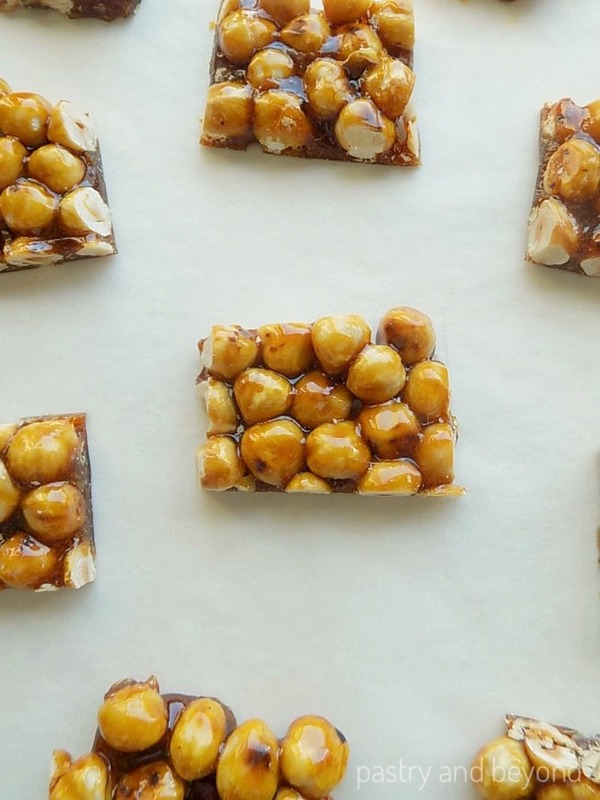 Place the caramelized hazelnuts onto the parchment paper and flatten with a spatula or spoon. Be careful as the mixture is very hot. Cut into pieces as you like with a sharp knife while still warm. *You can use raw hazelnuts and toast them. Or you can use toasted hazelnuts. I use roasted hazelnuts and toast them again as I don't find the aroma enough. If your roasted hazelnuts are full of aroma you can skip the toasting step.